Above is just names a few other differences from today to generations past. A big reason why we are broke is because we also have a bunch of nice stuff. Nice stuff we really can't afford, but largely thanks to easy credit, we think we can and actually deserve. Then once we have these luxury items, we fall under the illusion that we can't live without them, like cable and cell phones for an example. Of course our over consumption of things we don't need and can't afford is just one of differences between us and the generations of the past. Our ever expanding governments, and their over consumption of things they don't need or can afford, has increased our tax burden. Healthcare costs have sky rocketed. Of course, that is an extremely complex issue on it's own. There is no argument that heath care costs have increased tremendously. Also the advances in health care have increased tremendously too. For example, what once required open heart surgery, days maybe weeks in the hospital and months to full recovery can now be done with an out patient procedure to place a stint in your body and days or weeks to full recovery. Also, one needs to factory our lifestyle of fast food, over processed food, lack of excessive, little sleep and lots of stress into the health care cost equation. Many preventable conditions of heart disease, diabetes, high blood pressure, obesity, depression, etc. are brought on entirely, or at least, greatly increased by our modern lifestyle. We we are broke today can not be simplified to a Facebook meme or a blog post. We spend too much, have inefficient governments that spend too much, We live unhealthy lives and have a broken healthcare system that is collapsing in part of it. We don't question the out of control costs of education or products and services. As Dave Ramsey often says "we buy things we can't afford with money we don't have to impress people we don't even like." As Mike Rowe said we also "...are lending money we don't have to kids who can't pay it back to train them for jobs that no longer exist. That's nuts." 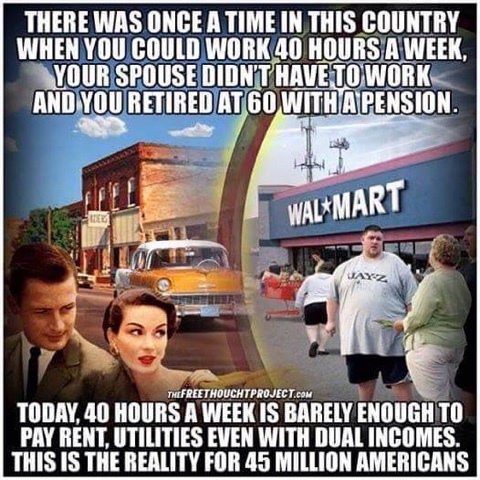 We can post, share, and comment on memes like the above, and say the cliche things like "the rich get richer while the poor get poorer", or blame the evil 1%ers or the governement, or what ever. But the only one we can blame is ourselves. We are the ones spending too much. We are the ones not keeping our government and service providers in check and accountable. We are the ones living a lazy lifestyle. We are the ones who drifted away from what made previous generations better than us.